Good news, everybody. 2016 is off to a great start! 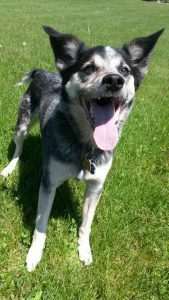 Just before New Year’s, I contributed a blog to PetCureOncology.com that included one of my personal goals for 2016. I am committed to doing my part to raise awareness for an incredible new technology called stereotactic radiosurgery (SRS), which offers the potential to cure pets with cancer in a way that we’ve never seen before. Have you heard of SRS? Bandit, a member of our family. I know that when I first found out about SRS, I was blown away. If anything ever happened to Bandit – our family dog and, in his own mind, chief security officer – we would be devastated. In our house, Bandit is pretty much an equal member of our family. I’m sure many of you feel the same way about your pets. 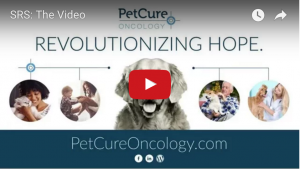 At this point, spreading the word about SRS is PetCure Oncology’s biggest goal as a company. After all, new technology takes time to enter the mainstream. While SRS is on its way to becoming a standard cancer treatment option, most pet owners are unaware that it even exists. Unfortunately, many of them will be directly impacted by the estimated 12 million dogs and cats diagnosed with cancer each year. The world of cancer care can be very confusing and advanced radiation therapy is even more complex, so we hope you benefit from this video and the information it provides. We encourage you to share it, like us on Facebook, follow us on Twitter, and help us in our mission to make sure that EVERY pet owner has access to SRS as a treatment option. Thank you for your support!